A native of Montreal, alto/baritone saxophonist & composer Dave Turner has been a mainstay of the city’s jazz scene since the mid 1970’s. During this time, he has performed extensively with his own groups around the Montreal area, and has been a featured performer at every major Jazz festival in Canada. He has also performed at many prominent clubs on the international jazz scene–Top of the Senator (Toronto), Sweet Basil (New York), Le lion s’envole (Liege) and l’Archiduc (Brussels), Dizzy’s (Rotterdam), Café Alto (Amsterdam). Dave Turner has been a featured soloist and lead alto saxophonist with the Vic Vogel Big Band since 1979. He has also collaborated with the Orchestre Metropolitain (conducted by Agnes Grossman), the National Arts Center Orchestra (conducted by David Amram) and, in 1999, he performed and recorded with the European Broadcast Union Orchestra in a series of concerts celebrating the centennial of the birth of Duke Ellington. 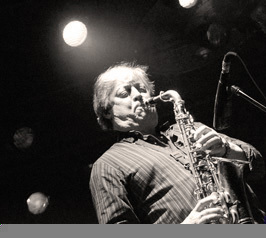 In 1996, Dave Turner was honoured as “Alto Saxophonist of the Year” by Jazz Report magazine. A prolific recording artist, he has released a total of ten albums under his own name, each one receiving wide critical acclaim across Canada, the U.S., and Europe. “Café Alto”, recorded in 1987, was nominated for a Juno. In 1995, he was the recipient of a Teaching Excellence Award from Concordia University for his work in the Jazz Studies program, of which he has been an involved faculty member since 1982.